We are in the midst of an extraordinary Jubilee of Mercy, called at the end of the celebrations commemorating the 50th anniversary of the close of the Second Vatican Council, capping commemorations that started with the Year of Faith. For the last four years, the Church has marked this anniversary in a number of ways. In October 2012, Pope Benedict presided over a solemn liturgy commemorating the opening of the Council, with Patriarch Bartholomew and Archbishop Rowan Williams in places of honor at his side. Also honored during the event 16 Council Fathers, any of the approximately 3000 bishops who participated in at least one of the four sessions of the Council. (At the time, there were several dozen still living). They were joined by eight Eastern Catholic Patriarchs, 80 Cardinals, 191 Archbishops and Bishops participating in the XIII Ordinary General Assembly of the Synod of Bishops, together with 104 Presidents of Episcopal Conferences from throughout the world. Today, a few months after celebrating the anniversary of the close of the Council, there are about 35 living Council Fathers; 19 of whom lived through all four sessions. Make the remaining Council Fathers members of the College of Cardinals. At the least, those who were Council Fathers for all four sessions. Of the 35, four are already cardinals, Francis Arinze, Jose de Jesus Pimiento Rodriguez, Serafim Fernandes de Arujo, and Sfeir (of those, only Arinze was not at all four sessions of the Council). So, that means 15 new cardinals, if only those from all four sessions, or 31 if all of them. All are over 80, so none would be voting. This is not about who selects the next pope or appointing people whose work lies in the future. This would be an honorary step, something to mark a half-century of episcopal ministry and leadership in the rarest and most solemn exercise of their ministry of governance over the universal church. This is about honoring the Council, and the entire church. A small, but symbolic gesture. Most likely, most would not be able to attend a consistory to receive the red hat and ring, but simpler may be better. I think it would be a nice way to close out the Year of Mercy, a final way to mark the 50 years of blessing brought by the Holy Spirit through the universal and extraordinary magisterium of the Church, expressly in a spirit of synodality. Granted: any credibly accused of sexual abuse of children, covering up the same, or other similarly grave matters should be excluded. With the success of the Year of the Priest under Pope Benedict, I humbly suggest to Pope Francis (or whomever is reading) that we should have a Year of the Deacon. If anything, the diaconate is suffering from under-attention far more than the presbyterate, so the same motives that made the first so successful and timely apply at least double for this suggestion! Plus, given that Francis of Assisi is often said to have been a deacon (though this is apparently in some dispute, whether he was ordained at all), it seems all the more appropriate that a bishop of Rome with that name initiate a year to honor and build up these Icons of Christ, Diakonos. Naturally, it should be done ecumenically, rather than unilaterally. Especially as the discernment of the nature of the diaconate is a shared ecumenical challenge and opportunity. Invite all the heads of communion to declare the same, and have an ecumenical gathering of deacons as part of the celebrations. I propose that the Year of the Deacon start on the feast of Deacon St. Lawrence of Rome, 10 August 2014 and conclude on the feast of Deacon St. Stephen of Jerusalem, Protomartyr, on 26 December 2015. 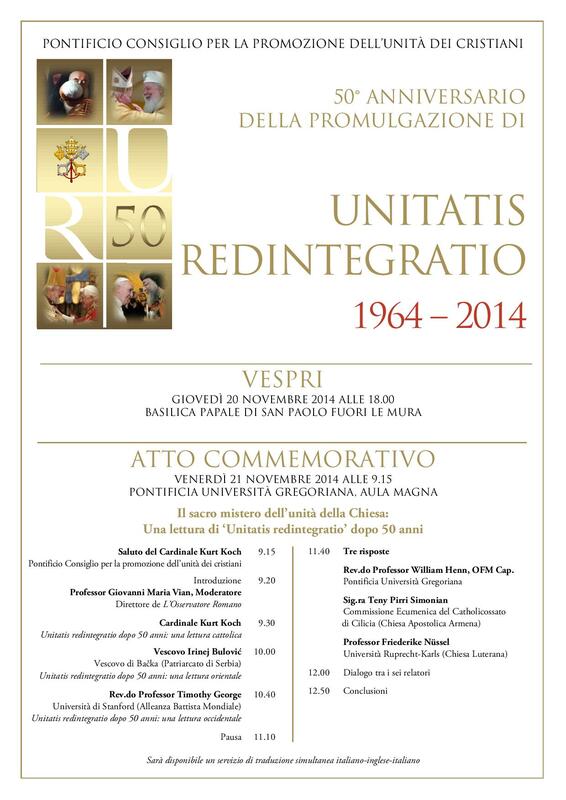 The highlight events of the year could take place on 30 October 2014 to recognize the 50th anniversary of the vote on Lumen Gentium, which included the call for the restoration of the diaconate to its full and proper place in the Catholic Church. These were the two saints invoked as patrons for the restored diaconate by Pope Paul VI in Sacrum Diaconatus Ordinem. Would it not be a grand sight, to see St. Peter’s filled with deacons and their wives from around the world, celebrating the liturgy with the bishop of Rome? Dioceses offering catechesis on the ancient office of the deacon, its institution, and the symbolism of the Last Supper as iconic for the diaconal office; a surge in vocational promotions efforts for the diaconate; a special synod on the identity of the deacon, including the question of women as deaconesses (or just as deacons)? What else could be done during such a Year of the Deacon? Ideas? From Seattle, a report on the upcoming National Liturgical Week by Michael G. Ryan, a seminarian at St. Thomas Seminary in Kenmore, Wash. This is an exciting time to be in Seattle. I never imagined that our city would host a World’s Fair, but now the “Space Needle,” as they are calling it, rises at the foot of Queen Anne Hill, and the sprawling modern buildings of Century 21 have taken the place of the quiet neighborhood where my dad once taught me to drive. 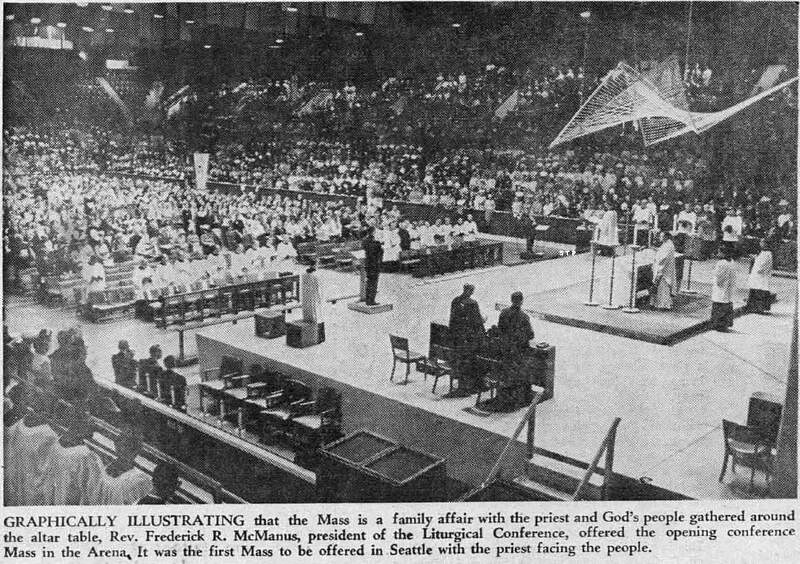 For Catholics, it is an especially exciting time, since Seattle will also be hosting the National Liturgical Week from August 20 to 23 at the World’s Fair Arena. We Christians are not indifferent to these works of human genius. We too are thrilled to find ourselves now at the very threshold of untold new worlds. But in all this we must be reminded again that our eternal hope lies still not in any works of man’s doing, but in the ageless Victory of the Risen Christ: in the triumph of Life over death. What is a Liturgical Week? The first Liturgical Week, sponsored by the National Liturgical Conference, was held in 1940, in a room in the basement of Holy Name Cathedral in Chicago. It was attended by just a handful of people, mainly priests. But these days, it is clear that the Liturgical Movement is not just a fad or a trend, nor is it only for priests. Pope Pius XII, and his successor, our beloved Pope John XXIII, have embraced the Liturgical Movement as the work of the Church itself. Last year’s Liturgical Week in Oklahoma City drew about 5,000 people–priests, religious, and laity–who came together to pray together and to learn more about the Church’s worship and to explore displays, listen to lectures, view demonstrations and art exhibits, and even take part in a contest for the best church design. This year’s Liturgical Week in Seattle is expected to be the largest yet, with as many as 6,000 participants. The added attraction of the World’s Fair, and the excitement about the forthcoming Ecumenical Council, both have something to do with the surge of interest in the Liturgical Week. All of us seminarians are glad the Liturgical Week is happening in August, because it means we are free to join in these exciting events. Most of us are helping out in some capacity or other, as it will take hundreds of volunteers to pull together this three-day event. There are dozens of drivers to bring special guests to and from the events. Others are forming a typing pool during the conference. About a hundred men and women will join in a National Choir. And then dozens of volunteers are needed as ushers and greeters at all the events. I have been assigned to host some of the guest priests in the mornings, and then to help at the information desk at the Arena in the afternoons. One of my seminarian classmates and I will be responsible for preparing for the priests’ morning Masses at the temporary altars which will be set up in lower level of the Mayflower Hotel downtown. It should be pretty exciting for us to serve the Masses of these liturgical luminaries whose names we have seen on the covers of books, but whom we never dreamed we would meet in person: Father Frederick McManus, the President of the Liturgical Conference, Father Gerard Sloyan of the Catholic University of America, and Father Godfrey Diekmann, OSB, from St. John’s Abbey in Collegeville, to name just a few. Arranging facilities for Masses has occupied much of the energies of the organizers, since about 300 priests will be participating in the Liturgical Week and each of them needs an altar to celebrate his Mass each morning. About 100 of them will be saying their Masses at St. James Cathedral, where in addition to the Cathedral’s altars, temporary altars have been set up in the Cathedral Hall. There are also about 28 prelates in attendance, and Father James Mallahan, the Seattle priest in charge of local arrangements, has had the large task of borrowing 28 prie-dieus from neighboring parishes and chapels, and returning them again when the Liturgical Week is over. It all begins tonight, with Mass at 5:00 p.m., celebrated by Father Fred McManus. It will be in Latin, of course, but there is a lot of talking and dreaming about a vernacular liturgy among the members of the Conference – even though one of our seminary professors told us recently that such a thing would never happen in our lifetime. A first for Seattle, and most people present: Mass in the ancient form, facing the altar and the people. But there will be one very noticeable change at the Conference Masses in the Arena: through a special indult from Rome, all of them will be celebrated facing the people! I wonder what that will be like. I’m especially wondering what it will be like at the concluding Mass when Archbishop Connolly is scheduled to be the celebrant. I’m not sure he is completely favorable to all the latest liturgical developments (which are really not new at all but far more ancient than what we have grown up with), but I suspect he’ll be a good sport and do his best. One thing is for certain: like the Space Needle and the other exhibits of the World’s Fair, the Liturgical Week promises to give us a glimpse of the future. It’s one I can’t wait to see! Back to the future: The Very Rev. Michael G. Ryan is pastor of St. James Cathedral, Seattle. Taken from Conciliaria: Fifty Years Ago Today at the Second Vatican Council. If you have not discovered this gem of a blog yet, you ought to. Can you imagine many people still having that same fearless confidence in the Holy Spirit speaking through the people of God, today? “Don’t wait for us, speak up!” Not exactly the dominant ecclesiastical paradigm half a century later! We hear much about the imaginary case of Conservatives v. Liberals in the church… The labels are misconceived, misplaced, and misleading. Today’s “conservatives” are mostly clinging to convictions and habits developed mainly after the Council of Trent; rare among them are those familiar with the church of the first millennium, and even rarer those who wish to return to its practices. They who in common parlance are called “liberals” hardly form a cohesive group. Many of them are simply searching honestly for the correct practical implementation of the conciliar vision. Others are “free thinkers” of sorts; they want to propagate the Council’s vision but do not have enough knowledge to do so within the balancing parameters of the Tradition; they easily fall into unacceptable excesses. With some simplification it is fair to say, though, that the contemporary fight between the conservatives and the (faithful) liberals is between the “Tridentines” and the followers of Vatican II. We had our first meeting of the ecumenical section tonight, in the famous Centro Pro Unione. At the Angelicum, there are four ‘Faculties’: Theology, Philosophy, Social Sciences, and Canon Law. The Theology Faculty, being by far the largest, is further divided into sections: Biblical Theology, Dogmatic Theology, Thomist Theology, Spiritual Theology, Moral Theology, and Ecumenical Theology. By reputation, at least, the two pillars of the Angelicum are its Thomist and Ecumenical sections. Part of the reason I decided to study here, in fact, is that it is the only specifically ecumenical licentiate/doctoral program offered by a Catholic university, and one of only three in the English speaking world (the others being at the Ecumenical Institute of the WCC at Bossey, Switzerland and the Irish School of Ecumenics in Dublin). 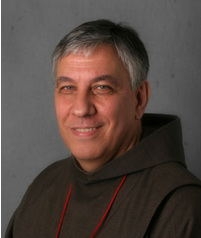 The ecumenical section is coordinated by James Puglisi, SA, the Minister General of the Franciscian Friars of the Atonement and director of the Centro Pro Unione. The Centro serves as the library for the ecumenical section, being the most complete ecumenical library in the world since its inception in 1962. It is located in the Collegium Innocenzium, part of the Palazzo Doria Pamphilj overlooking Piazza Navona. Originally the guest house for the family, part of it then became a house of hospitality named Foyer Unitas, run by the Ladies of Bethany, and the rest a place for the ecumenical observers at Vatican II to gather, named the Centro Pro Unione. The main meeting room is therefore steeped in history, both Roman and ecumenical. As the guest house of the noble family, this room is where Vivaldi first performed his “four seasons” after the premier in Florence. Franz List and Caruso played here, and so many others. During Vatican II, this room, with a grand view of the Piazza and its fountain, is where the ecumenical observers would gather with bishops and peritii for their weekly briefing, and where some of the most important texts of the council were born or developed: Gaudium et Spes, Unitatis Redintegratio, Nostra Aetate, and Dignitatis Humanae. There were 21 members of the section present or accounted for, and I am not sure how many others there may be. Six are from Africa, four from India, three each from the Philippines, Eastern Europe, and North America, one Italian and one Australian. One-third are lay, and two-thirds are priests; no religious and no deacons. There is currently only one woman (and she is technically in Philosophy, not Theology, but as a Russell Berrie Fellow is included in the section too).